The Central Square Farmer’s Market is back for the 2018 season! Open every Monday between May 14 and November 19, the market features a variety of vendors offering both produce and prepared foods. 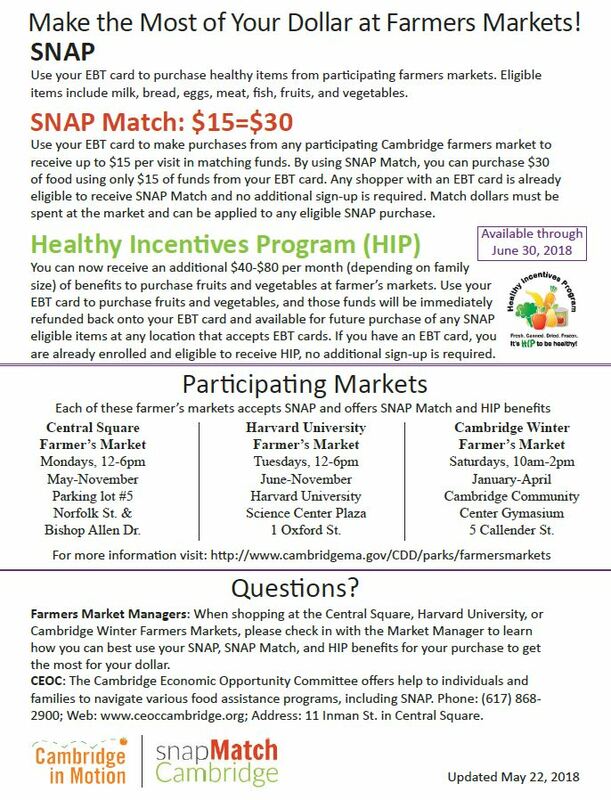 In addition to accepting both SNAP and WIC, the Central Square Farmer’s Market will also once again offer matching on all SNAP purchases, up to $15 per visit. This means that any SNAP shopper is able to purchase $30 of SNAP eligible items while using only $15 of their SNAP benefits. See below for additional information on how to make the most of your dollar at Cambridge farmer’s markets.